Do you want a tablet that’s a handy size with 16GB of expandable storage? 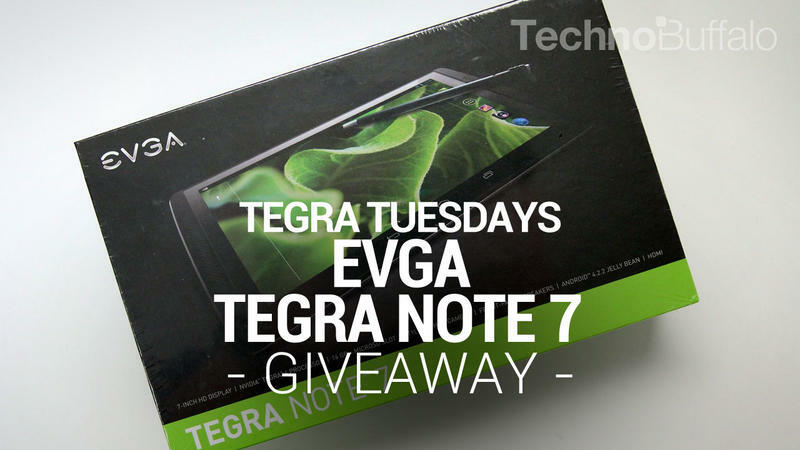 Then step right up as TechnoBuffalo is giving away a EVGA Tegra Note 7! Thanks to our friends at NVIDIA, TechnoBuffalo is teaming up with them for a series of giveaways called Tegra Tuesday. Every Tuesday we’ll be starting a new giveaway that will run for one week where you have a chance to win a device powered by a Tegra chip. This week we’re back with a EVGA Tegra Note 7. This tablet is powered by Android and comes with 16GB of onboard storage and 32GB of expandable storage! And, remember, just as you can with all Tegra-powered devices, you can hit up TegraZone for all sorts of entertainment that is optimized for your device. This giveaway is open to anyone in the world! So long as you have an address we can mail a package to, you’re good to go! To enter, all you need to do is leave one (1) comment per day on this post through 11:59 p.m. PST on Tuesday, March 18, 2014. More than one comment per day will result in disqualification. The comment can be about anything. We do ask, however, that you login with either Facebook or Twitter so we have a way of communicating with you should you win. Contest runs through 11:59 p.m. PST on Tuesday, March 18, 2014. Limit of one (1) comment/entry per day. Only comments on this post count towards entering the contest. The winner will be chosen at random from the comments by entering the final number of comments into Random.org and choosing them randomly. Remember, the contest closes 11:59 p.m. PST on Tuesday, March 18, 2014. Good luck, and here’s hoping you win! If you don’t win this week, don’t fret! This is the latest of several Tegra Tuesday giveaways. Check the TechnoBuffalo Giveaways page each week to see what that week’s prize will be.